This was one of the rainiest days all summer. It was raining hard and steady all morning. We decided to do a scaled-down hike that didn't require any scrambles due to the rain, nor any views which we couldn't see. 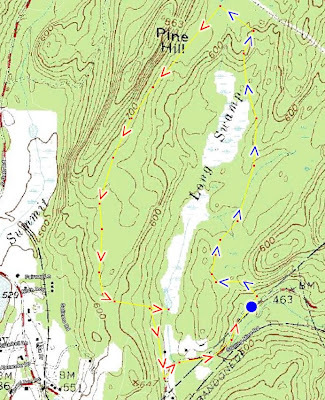 This is a relatively boring trail right on the border of Rockland County, that loops around the Long Swamp. There is very little to see on this trail and for the most part it is a wide woods road. Due to the heavy rains, many parts of this trail were very flooded, and almost the entire trail was terribly muddy. We started on the trailhead on Eagle Valley Road by the Power Lines. Headed up the trail where it splits at the loop. We found an old iron mine pit (don't know the name of this mine) which was fenced off all around. We made a right heading north on the trail. We kept on having to skirt around large puddles covering the trails by going thru the woods around them. Towards the end, we really got stuck where the trail crosses the southern end of the brook. It was totally swamped out and impassible. And all around was a swamp and there was no way around either. I don't know there isn't a bridge or a boardwalk here crossing the brook. We had to turn around and go through the woods, and use a GPS and our sense of direction to get back. We walked in the woods until we hit a residential street off af Sterling Mine Road, and then we walked from there back to Eagle Valley Road and then back to the car. USGS Map of the route. Mine near the beginning of the loop. I regret not taking a picture of the portion of the trail where it was totally flooded and inaccessible.